BSW are one of the leading central heating companies in the South East of England, offering boiler repairs in Eastbourne and throughout Sussex, Kent and Surrey. Having been established as a small, family-run business in 1962, BSW now employees over 100 people whilst maintaining its family work ethic and values. We believe in delivering the best possible service for the best value to all of our customers. Our team of certified engineers carry out boiler installations in Eastbourne for a wide variety of residential and commercial customers. Our technicians are Gas Safe and Hetas registered and we are approved suppliers and fitters for major brands like Worcester-Bosch and Glow Worm as well as many others. At BSW we understand the inconvenience a broken down boiler can cause. With no hot water to heat your house, keep your home clean or have a daily shower it can have a massive effect on a household – these issues are even greater if the breakdown occurs during the colder winter months. BSW are on hand to assist you with any boiler issue that may arise at any time, minimising the length of time the negative effects of a broken boiler are felt. Our experienced team of boiler engineers are all Gas Safe registered and fully accredited to work across all brands of boilers, including Worcester-Bosch and Glow Worm. 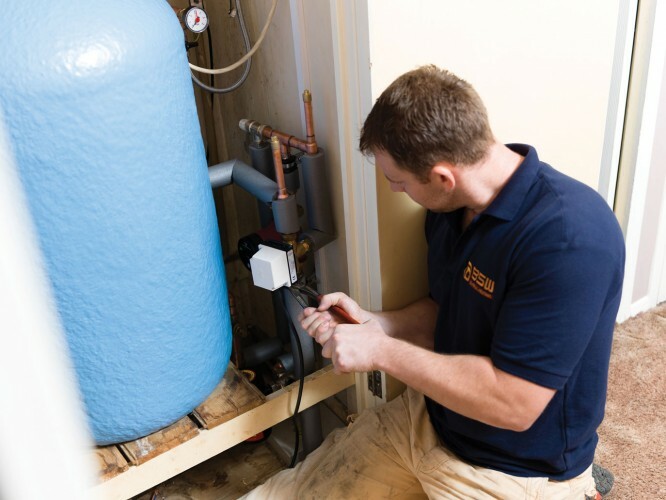 We have experience in repairing all types of issues that can happen within a boiler or central heating system and are able to assist with even the most complex break down. For those boilers that have either had a number of breakdowns or suffered a major failure, a replacement may be better suited. In these instances, BSW can install a brand new boiler to suit your needs and with our experience in providing boiler replacements in Worthing and other areas, we minimise any disruption or stress a broken boiler can have on you. Keeping your boiler in the best condition possible is vital to ensure its longevity. The average boiler has a lifespan of 10 to 15 years and regular maintenance can help a boiler last longer. We offer a range of fixed price boiler maintenance and service schemes to ensure your boiler is kept in the best condition possible, reducing the likelihood of it breaking down and leaving you with an expensive repair bill. For some, a boiler replacement may be an opportunity to change the type of system they use to heat their home. At BSW we place huge significance on our environmental responsibility and believe it is important to inform our clients of all the options that are available to them, including renewables. We are fully qualified to supply and install renewable energy systems under the Microgeneration Certification Scheme (MCS) and currently provide Air Source Heat Pumps, Biomass systems and Solar PV panels to customers. If you are interested in how renewables would work for you, please do not hesitate to contact us using the details below. We offer a free quote with no further obligations to all customers and believe that in order to provide you with the most comprehensive quotation possible a home visit is essential. We are more than happy to visit your home to assess your needs and requirements to produce a full and accurate quote for the work you need undertaking. If you require a quote for boiler repair in Eastbourne or the surrounding areas, get in touch with us today. To arrange your free home visit or to enquire about any other services, please get in touch with us via the enquiry form below or call one of our friendly team on 01444 831138.